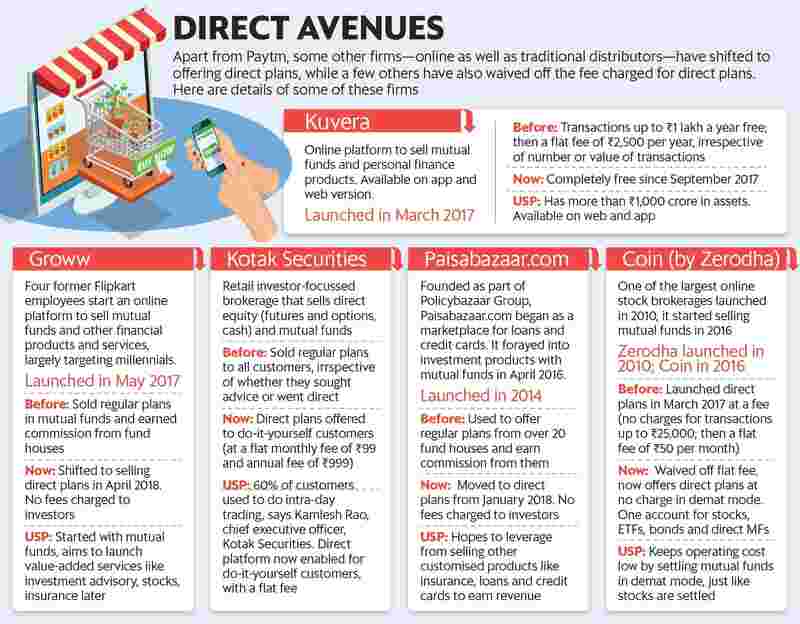 As Paytm Money Ltd enables users to buy and sell mutual funds (MFs) through its app—launched on 4 September—some online firms and traditional brokerages are now shifting to selling direct plans, and many of them are also offering the service for free. Kotak Securities Ltd, one of India’s largest stock brokerage and MF distributors as well as Coin by Zerodha have shifted to selling direct plans. Kotak Securities will soon launch a plan that will allow customers to buy and sell direct plans on its platform at ₹ 99 a month or ₹ 999 a year. Groww, an online platform to sell MFs that was launched in May 2017 by four Flipkart employees, shifted to selling direct plans in April 2018. Although Coin launched its operations in March 2017 by launching direct plans, it waived off its fee two weeks ago, partly in anticipation of the gush of investors that could take fancy to Paytm Money’s free offer. Just a fortnight ago, Sebi chairman Ajay Tyagi lamented at a conference that the industry isn’t doing enough to popularise direct plans. It was like Aladdin rubbing his lamp and a genie popping out to do his bidding. While regular plans are sold by distributors (these come embedded with distributor commission), direct plans are meant for investors who wish to invest directly with fund houses, bypassing distributors. Sebi-registered investment advisors, too, sell direct plans as they charge customers directly and are barred from earning commission. But over the years, smart investors—typically high networth individuals (HNIs) and corporates—have realised the savings that come with direct plans. Assume you invest ₹ 1 lakh in a fund that returns 14% compounded over the next 20 years. A direct plan (assuming an expense ratio of 1.5%) would give you ₹ 10.54 lakh, as against ₹ 9.14 lakh from a regular plan (expense ratio of 2.3%). That’s a difference of ₹ 1.4 lakh. No wonder then that direct plans have been steadily growing, but largely among HNIs. Assets under management of HNIs under direct plans have grown by around 70% on an average in the past three financial years, as per figures by Prime MF database. Small investors haven’t yet caught up. 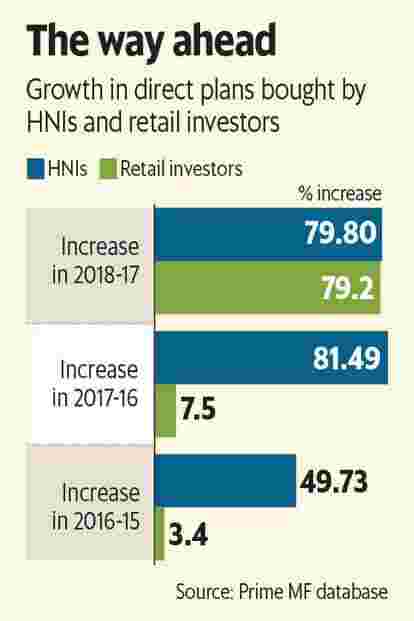 Assets under management of retail investors under direct plans have grown under 10% in 2015-16 and 2016-17, though in 2017-18 they grew by around 80%. “We know MFs are a superior investment product, and as long as customers can figure out the right asset allocation for themselves, and do long-term SIPs, there is no merit in them investing through regular plans. Even RIAs can offer direct plans, so it’s not that investors won’t have anyone to service them," said Manish Kothari, director and head – MFs, Paisabazaar.com, an online platform that sells funds. “It (launch of Paytm Money) will have an impact on regular plans. Till now, no one has publicised direct plans and the availability of these plans has been subtle. I expect the noise to intensify and awareness to increase around direct plans," said Anand Dalmia, co-founder and chief business officer, Finwizard Technology Ltd; the firm that owns the online MF advisory platform Fisdom. Dalmia, however, said that the added sweetener is that the focus has also shifted to waiving off fees. Offering direct plans is one thing, but not charging anything from the customer is quite another. While Zerodha experimented with a flat fee for its direct plan, Paytm Money’s offering compelled it to re-think its strategy. From March 2017 till a few weeks ago, it used to waive off all charges for transactions worth ₹ 25,000. After that, it imposed a flat fee of ₹ 50 a month, irrespective of the value of MFs bought. This, too, was waived off three weeks ago. “Paytm Money’s entry did nudge us towards waiving off all charges, but since we offer direct equities already, our MF offering is an add-on," said Nithin Kamath, chief executive officer, Zerodha. But Dalmia said that investors need advice. Giving direct plans is not a problem, he said, but it’s important to charge because it is costly to handhold investors, especially in volatile markets. Dalmia’s Fisdom has another app called MyWay, which sells only direct plans and does not charge any fees. His firm’s income comes from Fisdom —through the app, the firm ties up with banks and provides customers a platform to invest in MFs. Fisdom sells regular plans and earns commissions too. Direct plans getting popular is a good idea. If Paytm Money brings in busloads of investors, direct plans will get a boost. But just because an online MF platform offers direct plans—and better still, at no cost—doesn’t mean you should jump in. If you cannot sift and sort between hundreds of schemes on offer, you need advice and handholding. A good distributor or better still an RIA who charges you fees and invests in direct plans bodes well for you. But if you are a direct equity fund investor and can manage your investments well, then the rising popularity of direct plans is good news for you. Either way, say hello to direct plans.